Yes, you can row in a boat, in a lake, in the middle of the city. Right here. 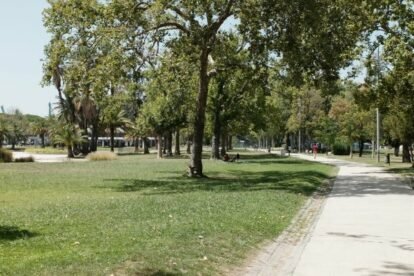 This park is located between Campo Grande and Alvalade and it’s the biggest green area in the city center. Just so you can picture it, it has the size of 11 football fields, with a 2.7km perimeter. Very close to the Lisbon University campus, you can find lots of students there, chilling or working, in the park or in the cafeterias that serve the area. The park was renovated last year with a new south wing with the name Mário Soares: a tribute to one of our former presidents known for his role in the birth of the Portuguese democracy, who lived nearby and died in the beginning of 2017. Rent and row a boat, have a picnic in the grass, jog, meditate, see the statues, have a coffee or a snack, after work drinks, play a game of Padel, walk your dogs in the canine park, visit the Ames room in the middle of the garden, take your kids to the children park or even learn math at the 4 mathematical benches you can find there.